Are you one of those advertiser, who is struggling to understand why your Display Advertising is not providing the desired results? If answer is yes, then this post is for you. Below are 4 most common reasons why your display advertising might not be working. Ad Views: According to a study by Sticky, 77% of ads are never seen by people. Even when the ad is considered viewable, meaning it is within viewing area, only 55% ads are actually viewable. Which results in a very lower click through rate, the average banner CTR is about 0 .1% and declining. 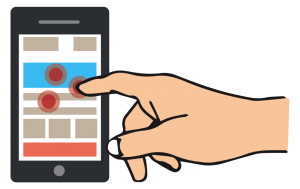 Fat Finger: Over 35% of the ad clicks on Mobile are by accident, again causing high Bounce Rate. Mismatched Landing Experience: Make it a seamless and consistent experience from your banner to conversion. Users don’t have time so make it right the moment they land on your site. For example, If a banner ad promotes “Free Trial” then make sure landing page make it easy for user to sign up for the free trial. Don’t expect the users to click through to your site to find where the “Free Trail” page is. Mismatched landing page and ad experience leads to High Bounce Rate and Low Conversion Rate. Site Speed: Slow site speed breaks visitors flow from a display ad to your site. If it takes too long for the page to load then the visitor will be gone before she sees the full page. In this case you will see a clicks but not visits and/or high bounce rate. External Links – If you have a lot of external links on you landing page e.g. “Like Us On Facebook”, “Buy this book on Amazon” etc. then you are purposely taking visitors out of your landing page but you might not be counting these clicks as valid site interactions thus inflating your Bounce Rate, as explained above. Profile Configuration: If you build a tracking profile of only select few pages on your site then any views of pages outside those select few are counted as “external links” (see above). For example, if you have 3 pages on your site, home.html, products.html, services.html but your profile only tracks home.html and products.html, then a click to services.html from any of these pages will be counted as an external link and hence counted as bounce if those were the only two page views that happened in the visit. Now that you know that your Bounce Rate might be wrong, do your own calculations and come up with the right number before you start redesigning your Landing Page. Recently, I came across a situation where all of the above applied. The Web Analytics tool reported that the landing page had over 90% bounce rate, after adjusting for above factors, we ended up in 50%+ range, which is still a little higher than industry average but not as bad as it initially looked (see average bounce rate). A Bounce Rate of 50% calls for different analysis and actions than a Bounce Rate of 90%. Twitter feeds keep flowing with over 9000 tweets every second (Source: http://www.statisticbrain.com/twitter-statistics/). Unless your followers are constantly watching their twitter stream the chances are that your tweets will not be seen by a lot of them. Below, I have listed three tips that will ensure that your tweets/content gets noticed and reaches most of your followers. Tweet at 9:00 AM PST (If all of your follower are in one time zone then tweet at 9:00 AM in your time zone). Tweet again the same message at 1:00 PST (4:00 EST) – (you might skip this if your followers are local. Tweet again the same message at 4:00 PST( If all of your follower are in one time zone then tweet at 4:00 PM in your time zone). In addition, I suggest adding another one later in the evening. Tweet Same Content on Different Days – If you have content that is evergreen then it make sense to tweet it again. Just like above, it might take few tweets over few days/months to get your tweets noticed by your followers. Additionally, tweeting your content again after few days/months will put your content in front of your new followers and those who might have missed it previously. However, going overboard with such strategy can potentially cause issues with some of you long time and ardent followers as they will see the same message over and over again. I use this strategy to tweet my old blog posts, which results in new retweets and followers. (I do it automatically- more on this in future). Add Images to your Tweets – Late last year, Twitter started showing full images (instead of a link) in the timeline, just like Facebook does. A study (http://blog.bufferapp.com/the-power-of-twitters-new-expanded-images-and-how-to-make-the-most-of-it) showed that tweets with images got 150% more rewteets than tweets without images. I suggest, you start including images in your tweets, when it make sense, and do your own tests to see how images affect the engagement with your tweets.